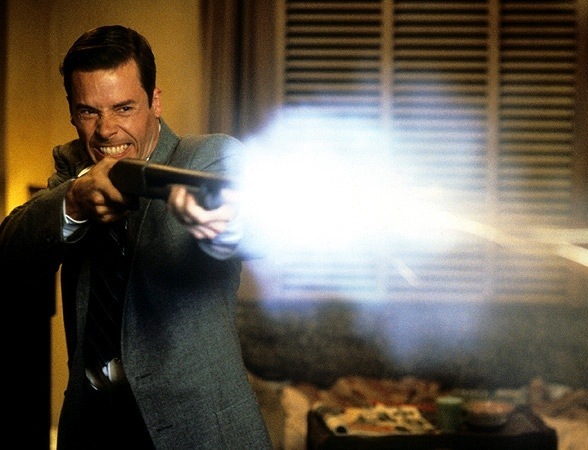 Screenplay: Brian Helgeland, Curtis Hanson. Starring: Kevin Spacey, Russell Crowe, Guy Pearce, James Cromwell, David Strathairn, Kim Basinger, Danny DeVito, Graham Beckel, Brenda Bakke, Paul Guilfoyle, Ron Rifkin, Matt Malloy, Simon Baker. James Ellroy is one of the finest of hard-boiled crime writers. For those not familiar, check out his “L.A. Quartet“; four novels, that delve into the seedy and corrupt world of the Los Angeles police force in the 1950’s. This film is actually based on the third novel in the series and director/screenwriters Curtis Hanson and Brian Helgeland have done a marvellous job in adapting Ellroy’s convoluted narratives and staccato writing. L.A. in the 50’s is rife with organised crime and corruption in the police force. Both intertwine in the glitz and glamour of the booming Hollywood movie business. The story follows the path of three very different police detectives. Jack Vincennes (Kevin Spacey) – the suave and ambitious type with an eye on stardom for himself. Bud White (Russel Crowe) – the brutal strong arm who will do anything to achieve his form of justice and rookie Ed Exley (Guy Pearce) – who does everything by the book and believes in law and order. A late night shooting in a coffee shop, which leaves one policeman dead brings these three detectives together in an elaborate plot involving corrupt politicians, prostitutes made to look like movie stars, gangster Mickey Cohen and sleazy tabloid journalists. First of all, where this film succeeds – in it’s difficult adaptation – is capturing the mood and setting. Not since Roman Polanski’s “Chinatown” in 1974 has this been achieved. The music by Jerry Goldsmith taps into film-noir with a seedy jazz score, while Dante Spinotti’s rich cinematography perfectly captures the infancy of the city of Los Angeles, before it’s economical boom. It was a city that could make or break a person, with corruption at every corner. This rich attention to detail, is also captured by some outstanding performances. 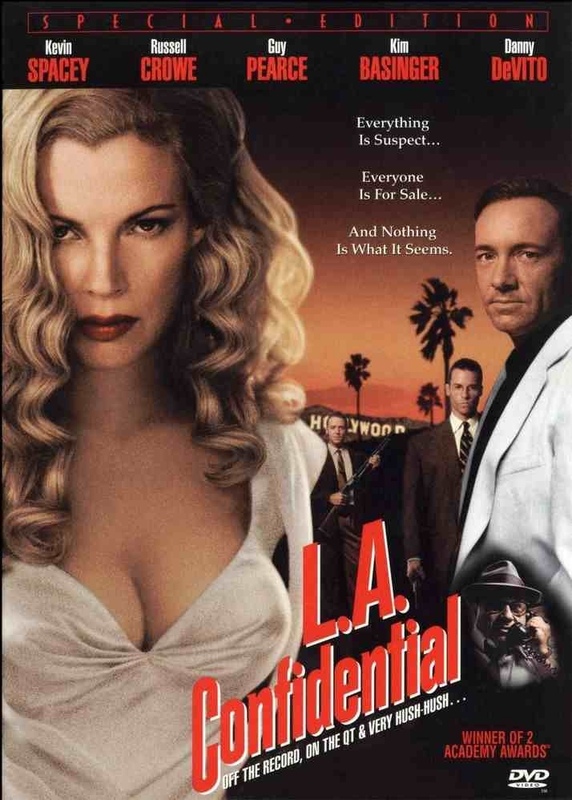 Kim Basinger won a supporting actress award but it’s Spacey, Pearce and particularly Crowe that own this film. Their performances have seldom been better. The story itself can simply be described as labyrinthine. There are so many facets that’s it’s hard to keep up. It demands your attention and commitment but it also rewards. Credit must go to Curtis Hanson, who does an excellent job in handling all the narrative arcs and teasingly fitting all the pieces together. This is filmmaking of the very highest standard. An absolutely enthralling film, that’s so vivid and compelling that fans of the genre should not ignore. This entry was posted on March 10, 2012 at 3:18 pm and is filed under Crime, Drama, Film-Noir, Mystery with tags 1997. You can follow any responses to this entry through the RSS 2.0 feed. You can leave a response, or trackback from your own site. As you already know this is one of my favorite movies. No one can say there a fan of crime movies and not like this one. Great review. Cheers Alec. It certainly is one of crime’s finest. I recently posted my top ten if you want to take a look? An amazing film. What a cast! Love the look as well. Just flawless. Every detail of the time is captured to perfection Fernando. It has always been likened to CHINATOWN but I personally think it surpasses that. My only small gripe would the Hollywood ending. It doesn’t end how the book ends. But for once, a Hollywood ending is still satisfactory. Love this movie, probably one of the best films adapted from a book. I would tend to agree and especially since James Ellroy never really seems to get great adaptations of his books – which is surprising. I love his stuff but this is probably the only film that can claim to be a classic. However, when I recently posted my top ten films, I found that most of them were actually adaptations. I just realised this the other day. Cuckoo’s Nest and Blade Runner and Trainspotting being the most notable ones. Very good point, all of those are amazing films. Maybe one of the best crime thrillers adapted from a book? haha. I’ll have to check out your list. Haha. I totally agree! Definitely the best crime novel adaptation. I really wish they’d have a go at adapting “Whit Jazz”, the book that follows “L.A. Confidential”. Excellent review, this film is acted amazingly and visually outstanding. Cheers Vinnie. I love it man. It’s one if my personal favourites. I notice you have a review up yourself? I’ll get round to that later today.